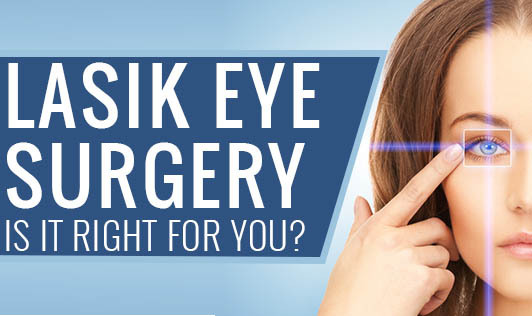 LASIK Eye Surgery- is it right for you? For years, people have been dependent on external lenses in order to alter the angle of the light entering the eye. Whether it is contact lenses or glasses, these have proven to be invaluable in the correction of poor vision. LASIK eye surgery which stands for laser in-situ keratomileusis is a very popular surgery that corrects vision in people who have moderate degree of farsightedness, nearsightedness or have astigmatism reducing or eliminating the need for eyeglasses or corrective lenses.A good surgical outcome usually depends on careful evaluation on your eyes before surgery. •It works and it corrects vision. Around 90% of the patients will have their desired vision after LASIK. •It is associated with very little pain. •The vision can be corrected immediately or by the day after the surgery. •No stitches or bandages are required after LASIK. •Adjustments can be made years after LASIK to further correct vision. • After undergoing the surgery, most patients have a spectacular reduction in eyeglass or contact lens dependence and many patients no longer need them at all. • LASIK is complex and problems may occur when the doctor cuts the flap which can permanently affect vision. • Changes made to the cornea cannot be reversed after the LASIK. • It can rarely cause a loss of the best vision, the highest degree of vision that you achieved while wearing contact lenses or eyeglasses. • Undercorrection: Not enough tissue removed during the procedure. • Overcorrection: Too much tissue removed during the procedure. LASIK Eye Surgery: Is it for you? •Have a condition that may impair your ability to heal: Autoimmune diseases such as Rheumatoid arthritis and immunodeficiency diseases such as HIV increase the risk of incomplete healing, infection and other complications. •Have persistent dry eyes, especially for women aged 50 and older. •Have unstable vision: If the pressure inside your eye is too high or the quality of your vision is fluctuating or getting worse. •Pregnant and breastfeeding: Vision can fluctuate during pregnancy and breast feeding, hence the outcomes of the LASIK surgery is uncertain.